The Alphabet Chair is another textural piece with an Alphabet theme. The textures on each letter start with that letter. For example, A if for Animals, B is for Buttons, and C is for Coral. The Chair easily supports three small people or two big ones. It is a great library sculpture, as it promotes reading and letter recognition. The photo to the left was taken at the foundry, before the back legs were welded into place. The Alphabet Chair, bronze, by Sarah Peters, is a functional interactive sculpture with a textural alphabet puzzle theme. The textures on each letter are objects that begin with that letter. The playful shadows of The Chair are integral to the sculpture. The letter textures can be tricky to identify, but children are often the first to solve the whole puzzle. The Alphabet Chair is very at home in libraries, especially among the children's books. Countless story times have gathered around The Chair. It is a common gathering spot for author visits, group photos, and alphabet games. This Alphabet Chair lives at the Lewisville Public Library, in Lewisville, TX. Ruthie, the elephant, lies down for Sarah as she makes an impression of her skin with Play Doh. The E on the Alphabet Chair is for Elephant Skin! Eight Cousins Children's Bookstore, in Falmouth, MA, owns the very first Alphabet Chair. It was commissioned by the former owner, Carol Chittenden, an enthusiastic supporter of the arts. 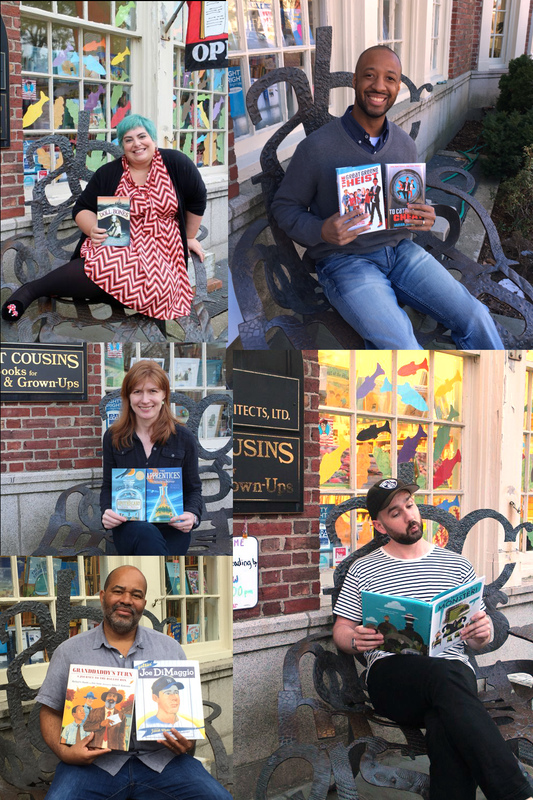 At Eight Cousins it's tradition to snap a photo of visiting authors and illustrators in the Alphabet Chair. Check out Pinterest for many more photos! Here we have, clockwise, authors Molly Black, Varion Johnson, author and illustrator Peter Brown, illustrator James Ransome, and author Maile Meloy.